“Absolute Curtains” the 7th and final installment of these fabric giants. a 3 year chapter of my life. An ode to air, and awakening of the spirit winds. Part art installation, part spirit realm the intention put into every moment of this manifestation was soulful, and true. The Etherial Architecture of Absolute Curtains created a very large space (100ft x 20ft) made up of 18 textile monoliths in 3 concentric circles ( 3 . 6 . 9 ) with a hexagon deck in the center. We were nestled in the womb like shelter, surrounded by our living, breathing, guardians. Using a 6 point hexophonic sound system A Sonic Odyssey took place which touched upon key moments in musical history, iconic interviews, field recordings, and soundscapes from all over the world. Collaborator Caleb Townsend, and sound engineer John Clements made the aural side of the installation possible. Huge thanks to Mason Rothschild, Phil Pirrone for trusting in the vision and funding the project. Peter Albrecht, Mieka Ginsburg, Clark Treese, John Michael, Xavi Valerino, Corey Fedor, Caleb Townsend, John Clements and many more. This has been a long beautiful journey. I thank everyone who has appreciated the many facets of this simple & elegant manifestation. This installations is currently being stored at the Hi-Lo Homestead in Landers, CA If you would like to purchase part or all of the curtains reach out. The dream is to see it installed for a few month run at a museum, or public park. If you have links to make that happen please reach out. We are having a baby! Holey Moley! Mieka is growing a human! She’s a baby oven! A cosmic email download box! So much exciting to fit into one year. Due date is March 9 and we can’t wait for our little daughter to be brought into this world. It isn’t easy, and sometimes it isn’t pretty. Plenty of arguments, and debacles have occurred. Mieka has felt much pain and discomfort, but thru it all time washes over these things and a beautiful new life begins to grow. i wrote down these word below one evening while sitting next to Mieka in bed at the hot springs. From our room there you can hear the flowing water just beyond the bedroom wall. It’s a magical place. River is a 150ft meandering bundle of sticks, twigs, and deadfall. A visual reference of the continual decay happening around us in the forest. 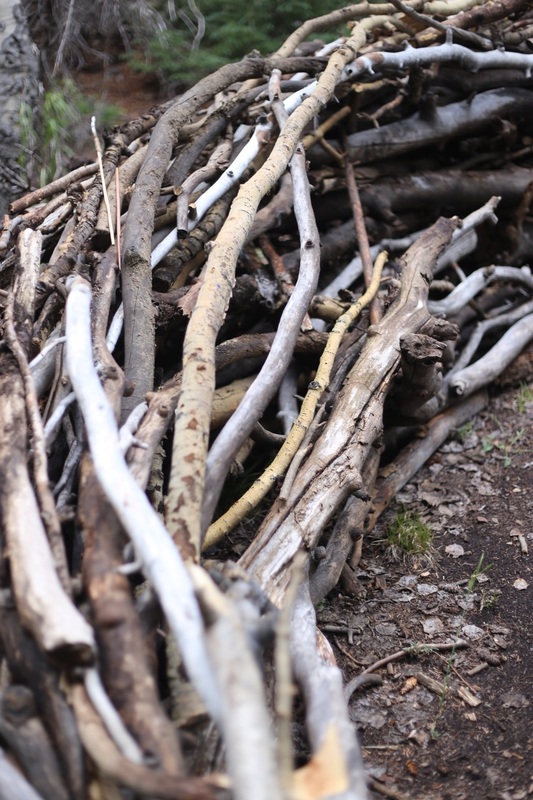 Using a fundamental law of nature: “the path of least resistance” we gathered the deadfall of the forest into a bundle in a way which was easiest to reveal the canopy floor and allow for pathways to exist while at the same time forming the sculpture itself. River is the cycle of life within nature. A birth death decay birth cycle; As the sculpture begins to decay we will ennoculate with mushroom spores. Thus, river was formed. A pile sticks with a meaning. Curated by Shane Gadbaw & Eagle point Ski Resort. I have been inspired to play with sticks in such a Fasion for many years. I find joy in the repetition of items. Either man made, or in nature. Often times, especially in the fall I would try and grasp onto the beauty in the changing season by spending time in nature, gathering stick, leaves, or rocks and form them into shapes. This project was no different. Aspen Grace is a Childrens Park and Sculpture garden. Named after the first child born at Eagle Point. This project has been an all time high for me. It is the first opportunity someone has asked me to create something permanent. When finished The Park will consist of 8 sculptures, and a dozen other functional features. On a basic level the park consists of a place for children to play, families to gather, teens to wander, and elders to stroll. A children’s park for children of all ages. On an artistic level the park is multi disciplinary, dualistic, and well balanced. Consisting of Two main themes, masculine/feminine, and cycles/seasons. The Park is located in a 1/4 mile stretch of trees splayed between ski runs, with a Bike path weaving thru the middle. It is best accessible from the Aspen Crest area. You can experience the Park for yourself at Eagle Point Ski Resort. 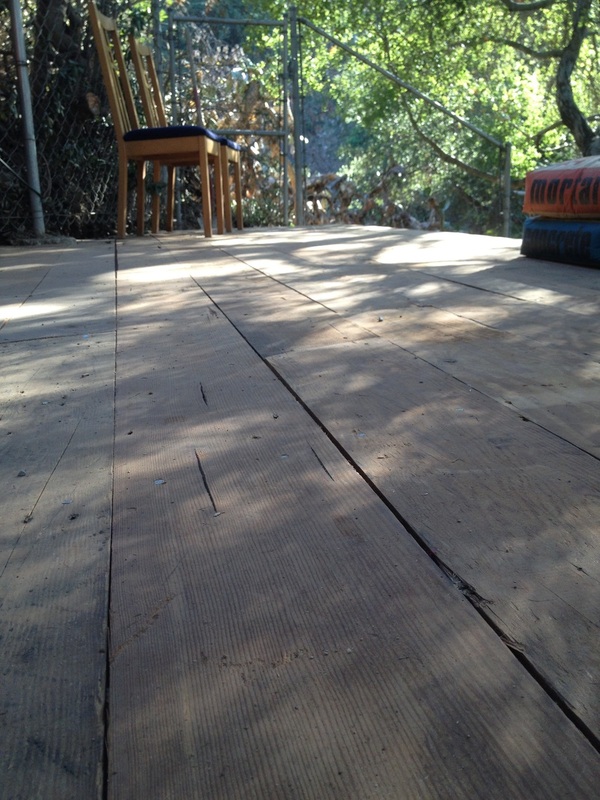 once installed we sealed the wood with Tounge oil and placed two color changing solar lights at the base. You can experience droplet for yourself at eagle point ski resort. Stroll around the up and coming summit community. Hi-Lo homestead up and rocking! Well, Its official!!! The Property has a name! We have created a name, and I designed the logo for our 10 acre art ranch in Landers, CA! 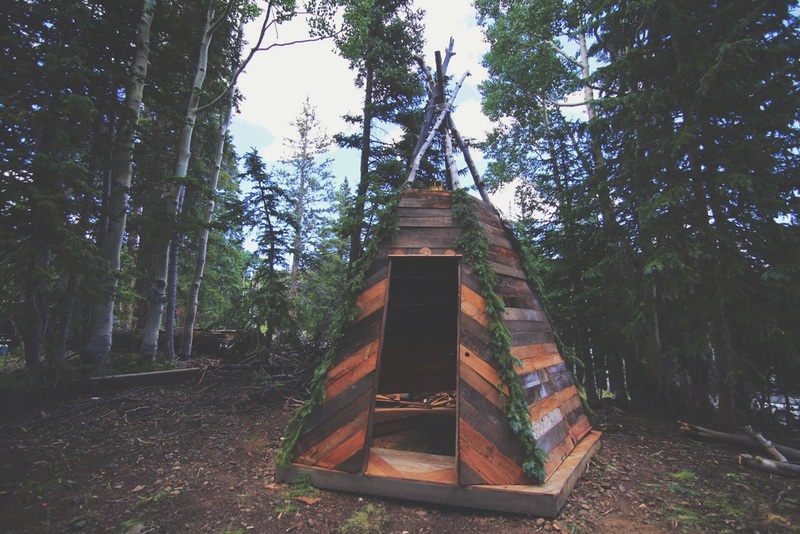 thanks for the love Dwell Mag! Dwell recently posted a spread for The Butchers Daughter, showing off my woodwork. 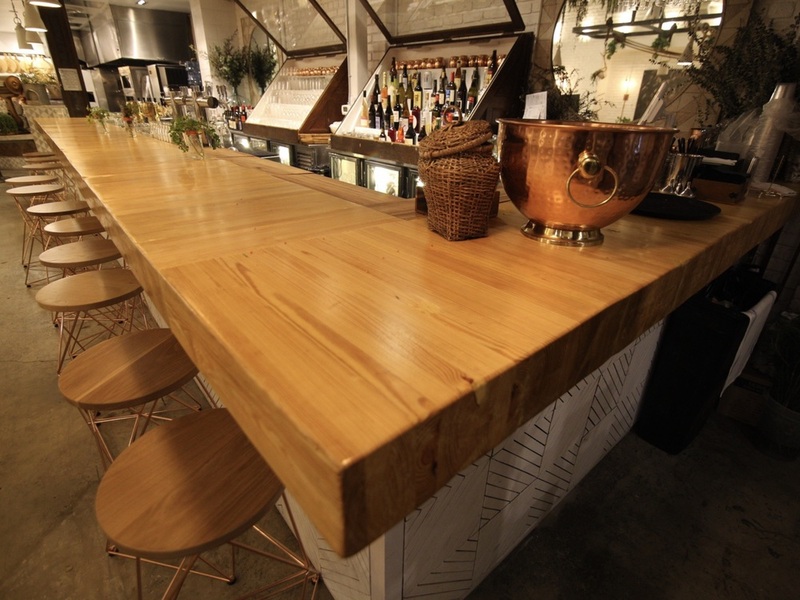 ∆ ceiling, and countertop built by yours truly, with the help of fantastic friends of course! Aka My favorite room in the house. 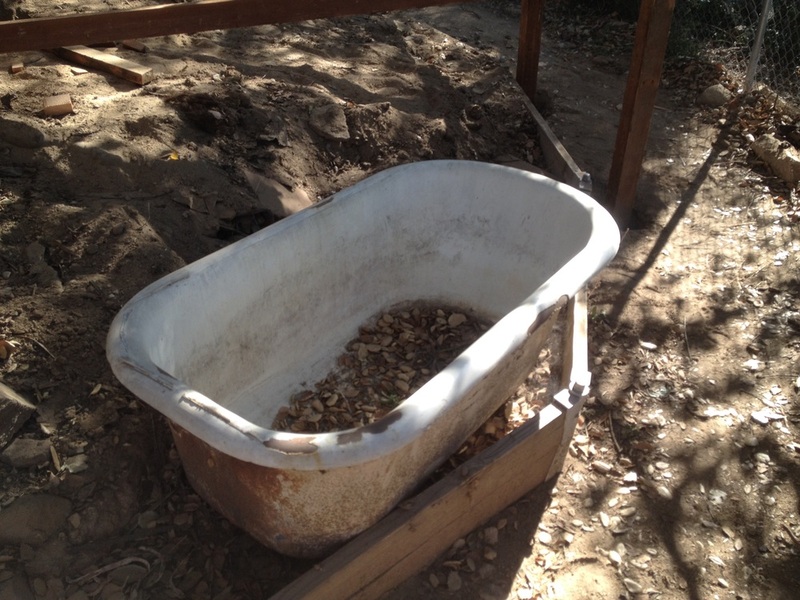 We had a scrappy dirt slope of a backyard when we moved into our home in Eagle Rock 3 years ago. So I decided quickly to upgrade us to deck level. Complete with sunset views, and a fully functioning bathtub. 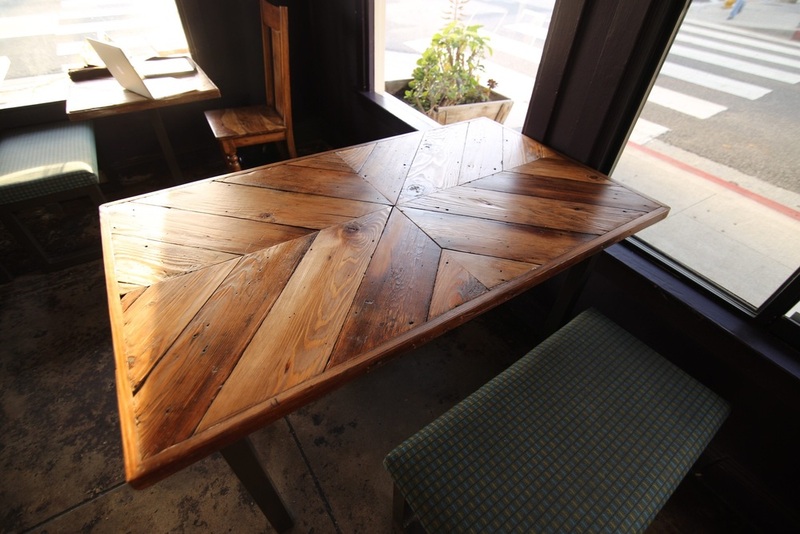 All built with reclaimed lumber. 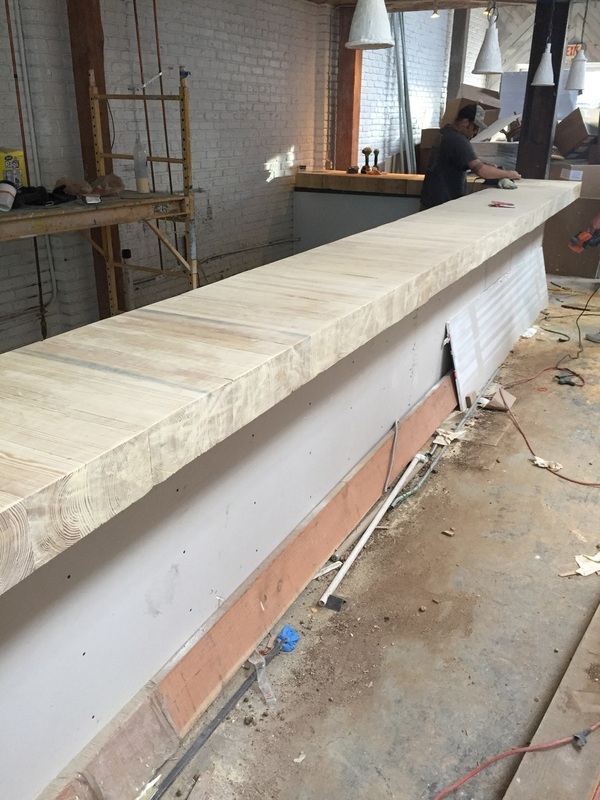 It took 3 structural roof beams to fabricate this bar in Venice. 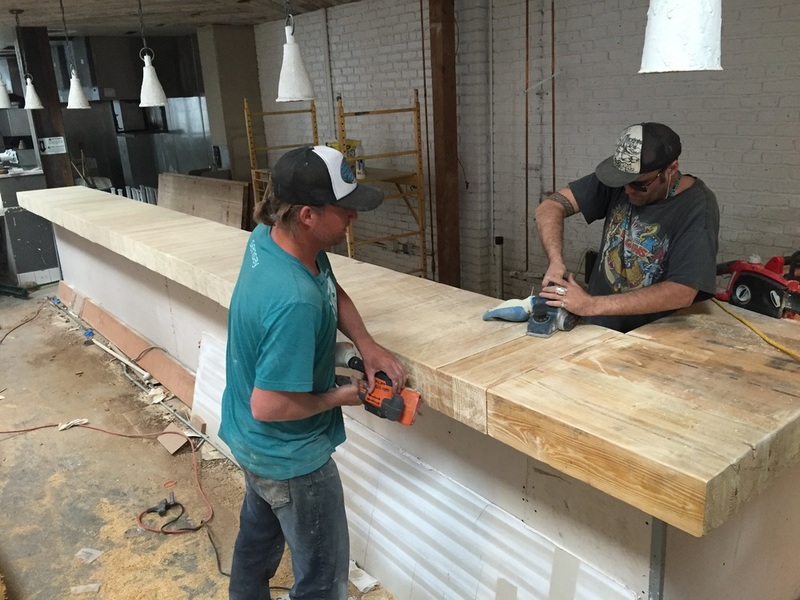 In order to have grain side out I cut about 20 2ft pslabs with a chainsaw, and we glued them together. It took about 4 days of planing and sanding to get it to its final look. For July 24th weekend Mystic hot springs throws a music festival. I built a number of projects for the event and this was I think my favorite. Pallets are where I originally started building so it was fun to bring it back... But with a little extra flair. 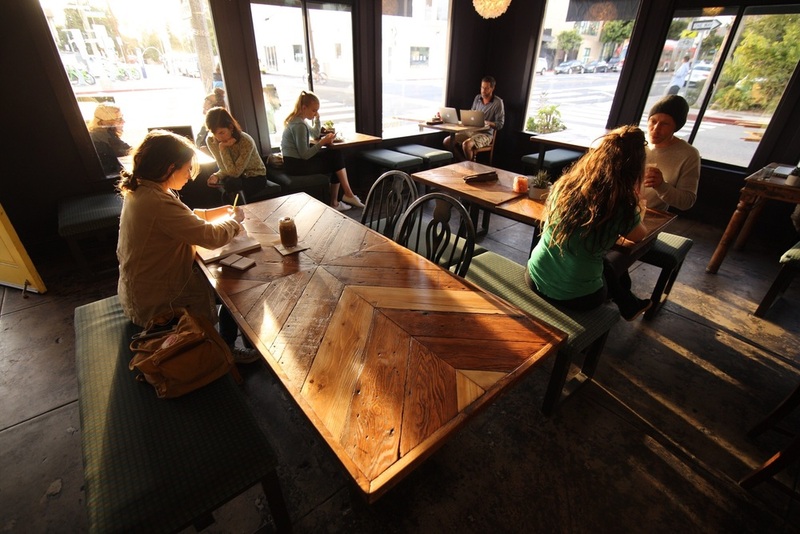 I was commissioned to build ten tables at Venice vegan restaurant Rawtopia. If your ever on the west side go grab a bite, and a bucha, and check em out! 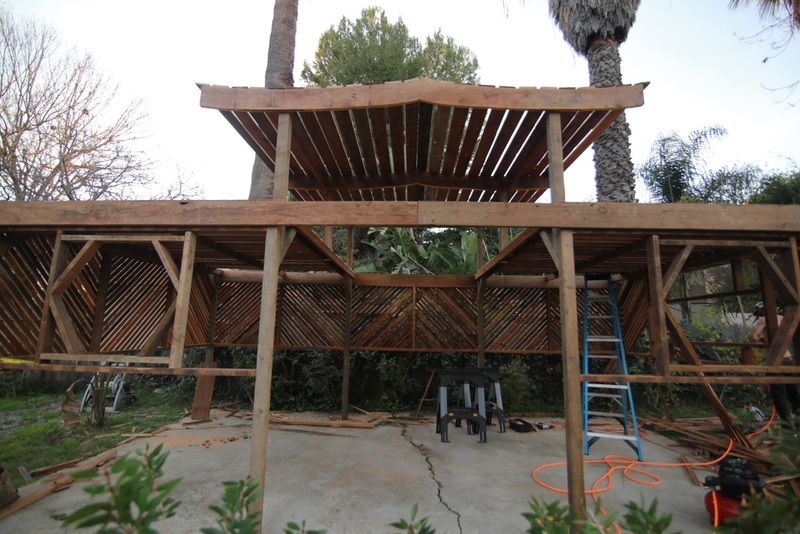 A dear friend Randy Sosin commissioned to create a wooden structure in his back yard in Los Angeles. 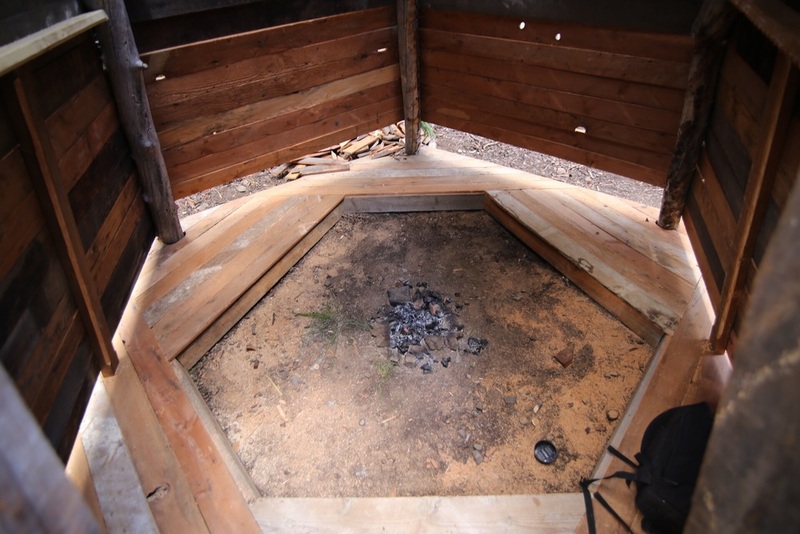 it was placed on top of an already existing slab of concrete and would house a hot tip and good times. 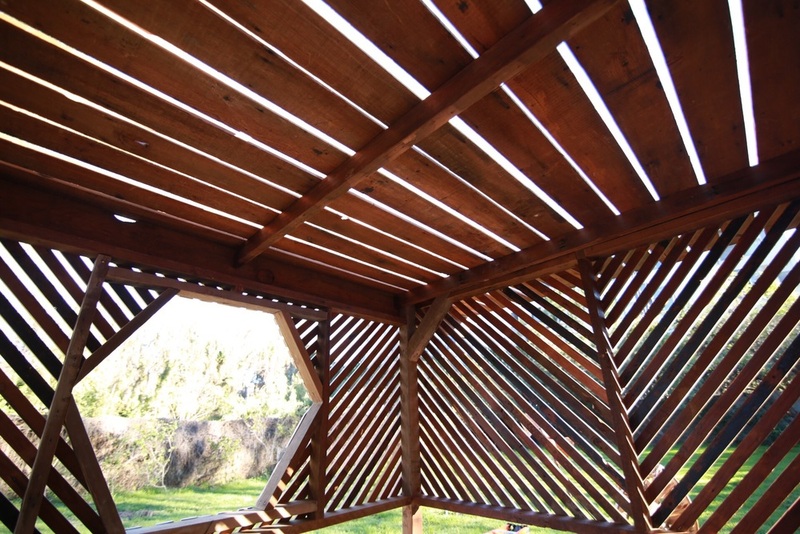 It was completely built from deconstructed roofing slats. The feeling of freedom is so easily obtained for me when I am in the forest. 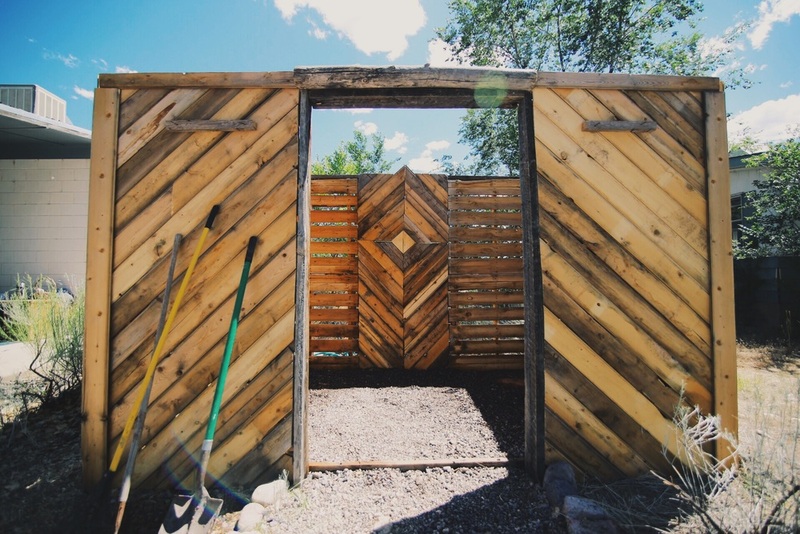 These were two installations I built at over 9000 feet on top of a mountain in southern Utah for the event Roots of the rocks. 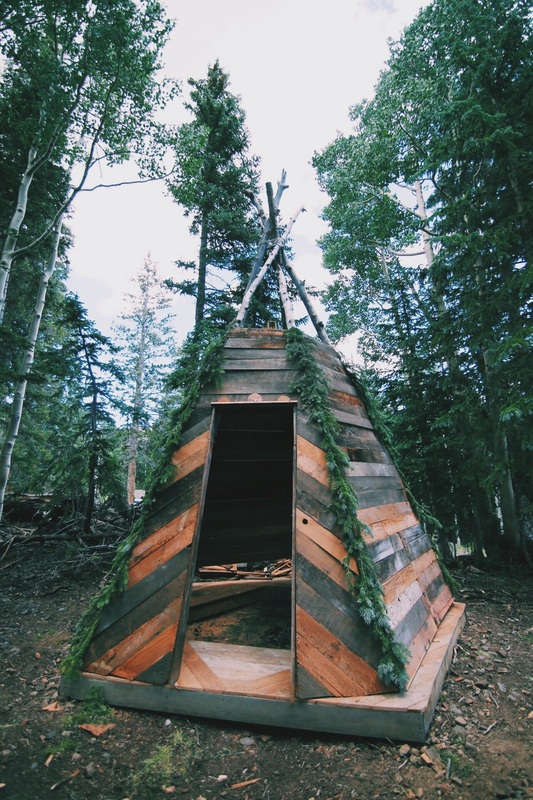 The first was a 8ft diameter wooden teepee. 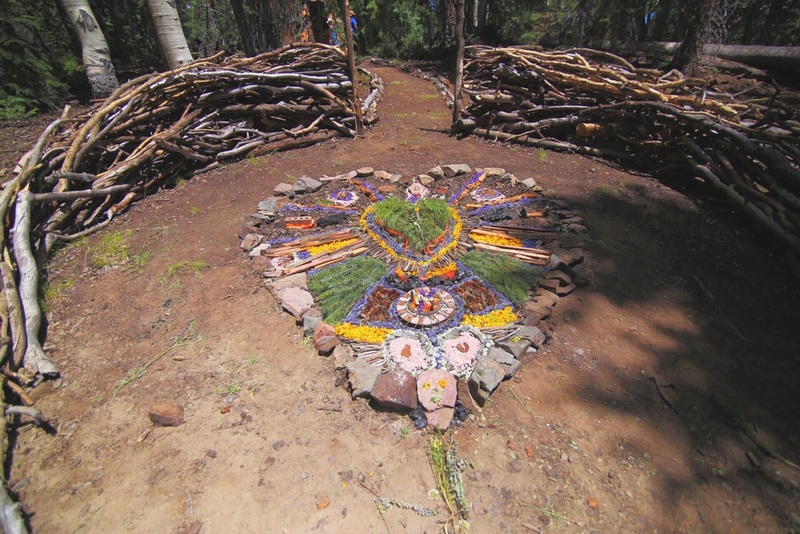 The 2nd was a natural built earth art sculpture made from sticks and branches creating space for a heart shaped mandala made from an array of natural materials including: flowers, leaves, charcol, copper, and much more. It was a successful project, the only issue I had with it was it didn't keep the stash stiff for long enough. It is tough to get a good stiff product without using any artificial ingredients like petroleum jelly.